HARARE – Opener Chamu Chibhabha hit 90 as Zimbabwe, aided by bad light, held off a spirited revival from Pakistan to level the one-day international series with a five-run victory in the second match at the Harare Sports Club on Saturday. Chibhabha’s steady innings propelled the home side to 276 for six in their 50 overs after being sent in to bat. Pakistan collapsed to 76 for six in their reply, before rallying in the second half of their innings on the back of an excellent 96 not out from experienced batsman Shoaib Malik to leave them with 21 to get from the final two overs. But with darkness descending on Harare, home umpire Jeremiah Matibiri and Ruchira Palliyaguruge from Sri Lanka pulled the players from the field and revised the Pakistan target to 262, leaving Zimbabwe victorious with the visitors stranded on 256 for eight in 48 overs. Chibhabha, who was out for 99 when Zimbabwe toured Pakistan in May, looked as though he would score his maiden ODI ton before poor footwork saw him flash at a wide delivery from seamer Wahab Riaz and offer a low catch to wicketkeeper Sarfraz Ahmed. Standing back in the crease, Chigumbura attempted to smash a low full toss, but succeeded only in crashing his bat into the wickets as he played the shot. Riaz finished with figures of four for 63 in his 10 overs. 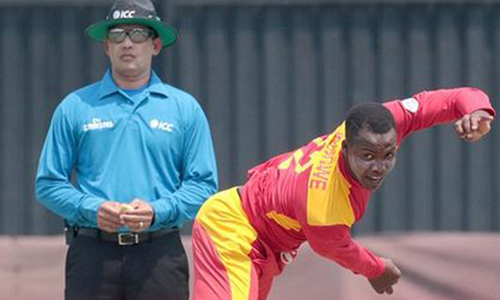 Pakistan made a disastrous start to their reply as Zimbabwe seamer Tinashe Panyangara dismissed both openers cheaply on his way to figures of two for 44 in nine overs.